Avro2TF is designed to fill the gap of data processing before training to make users’ training data ready to be consumed by deep learning training frameworks. It reads raw user input data with any format supported by Spark to generate Avro (LinkedIn as a heavy user) or TFRecord tensorized training data. 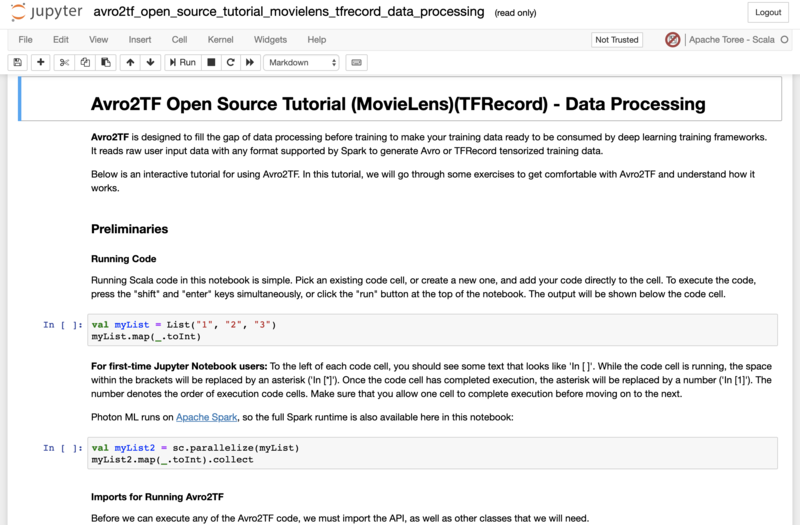 Avro2TF exposes to users a JSON config to specify the tensors that a modeler wants to use in training. What existing features are used to construct the tensor. The expected name, dtype, and shape of the tensor. The final tensorized training data will be stored in Avro or TFRecord format. 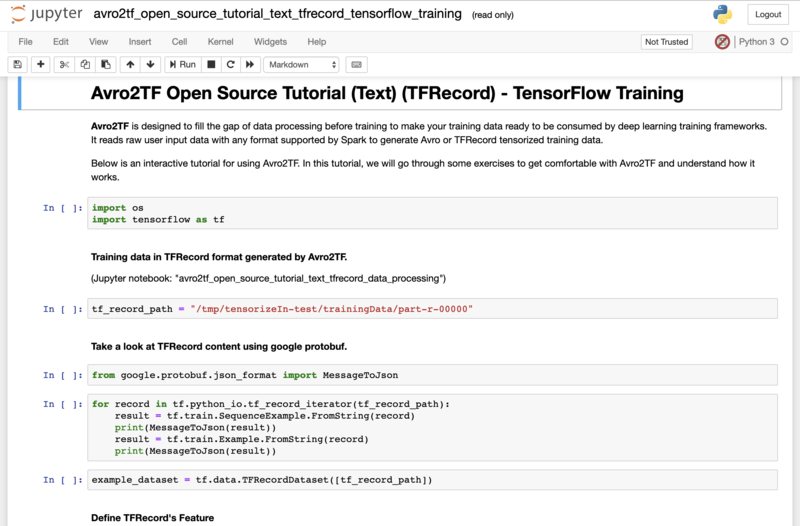 Downstream in TensorFlow, we provide a native AvroRecordDataset TensorFlow API in addition to the official TFRecordDataset API to load the tensorized data to in-memory tensors. Flexible: Even the most complex applications can be containerized. Lightweight: Containers leverage and share the host kernel. Interchangeable: You can deploy updates and upgrades on-the-fly. Portable: You can build locally, deploy to the cloud, and run anywhere. Scalable: You can increase and automatically distribute container replicas. Stackable: You can stack services vertically and on-the-fly. A web application: a browser-based tool for interactive authoring of documents which combine explanatory text, mathematics, computations and their rich media output. Notebook documents: a representation of all content visible in the web application, including inputs and outputs of the computations, explanatory text, mathematics, images, and rich media representations of objects. The Avro2TF tutorial runs in Docker. You will need to install Docker or Docker Toolbox on your system to use it. To install Docker, visit https://docs.docker.com/engine/installation/ and follow the instructions to download and install Docker for your operating system. After you have installed Docker, launch the Docker daemon (this happens automatically on some systems). Click the Docker icon from your application folder. Then try something like, docker login, docker ps. The next step is to install and launch the Avro2TF Open Source Docker image. The tutorial contains detailed instructions on how to run it within the Jupyter notebook. The tutorial sample gives you read permission. If you want to do some of your own quick experiments on it, feel free to "Make a copy" but not distribute it without noticing us.